Chivas Regal, the world’s first luxury whisky, has launched Chivas Regal Ultis; the first blended malt Scotch whisky from the House of Chivas. 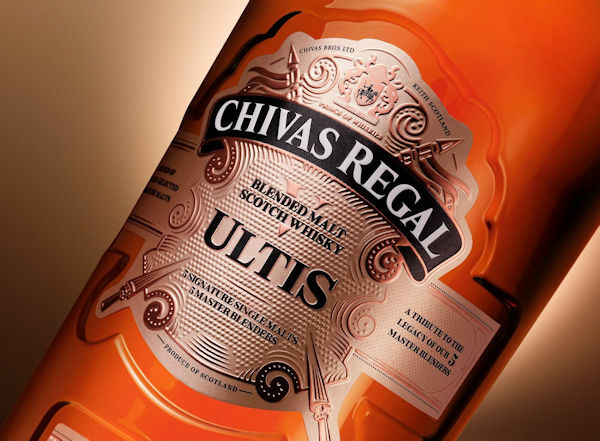 Capturing the true essence of Chivas Regal, Chivas Regal Ultis uses only five of Chivas Regal’s most precious, signature single malts from Speyside, Scotland, and represents the style and diversity of this prestigious, world-renowned whisky region. The latest release has been crafted with hand-selected malts from Tormore, Longmorn, Strathisla, Allt A’Bhainne and Braeval, presenting complex flavours, a golden hue and a commanding rich aroma. Out of millions of casks in inventory at Chivas Brothers, less than 1% are used to create Chivas Regal Ultis, with the expert blending team individually nosing and selecting those of the highest quality to craft the blend; a traditional method of hand-selection that is no longer standard in the Scotch whisky industry today. The luxurious Chivas Regal Ultis bottle mirrors the precious whisky within and is designed to provide impactful on-shelf stand-out with a slender shape and contemporary crest in gold champagne. In honour of the Chivas Regal Master Blenders and representing the five signature malts within, the bottle features a unique pen-clip closure which is etched with five rings, and a striking placement of the Roman numeral figure for five on the highly crafted base and within the textured crest label. Chivas Regal Ultis will be launching globally in all major retailers and travel retail from October 2016 at a RRP of USD$200.